Poster of the event. Taken from the Powerbooks Facebook Page. When one of your favorite authors travels from across the oceans and has scheduled a talk and book signing, you meet her halfway -- granted, it was Tessa Dare who went the greater distance (with her 14-hour flight vs my 55-minute one). They had all of Tessa's books out. I registered at 11ish and was already #15 in the book signing queue. 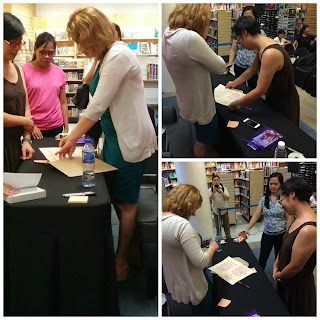 I know many romance authors have done tours and attended conferences in Australia, but this was the first time an author was visiting my country, so I considered this a once-in-a-lifetime opportunity. Small token ready, flight and hotel booked, and fan-girl heart switched to "on", I brought my husband with me to the event. PowerBooks and National Bookstore did a good job of organizing the book signing. They gave each one of us a queue number, that indicated the number of books they were having signed. Seats and venue were set up early and everything looked so beautiful -- and surreal. On Twitter, Tessa Dare jokingly compared it to an Oprah set. For me, this was something I had only seen in photos online from fellow bloggers in the U.S. 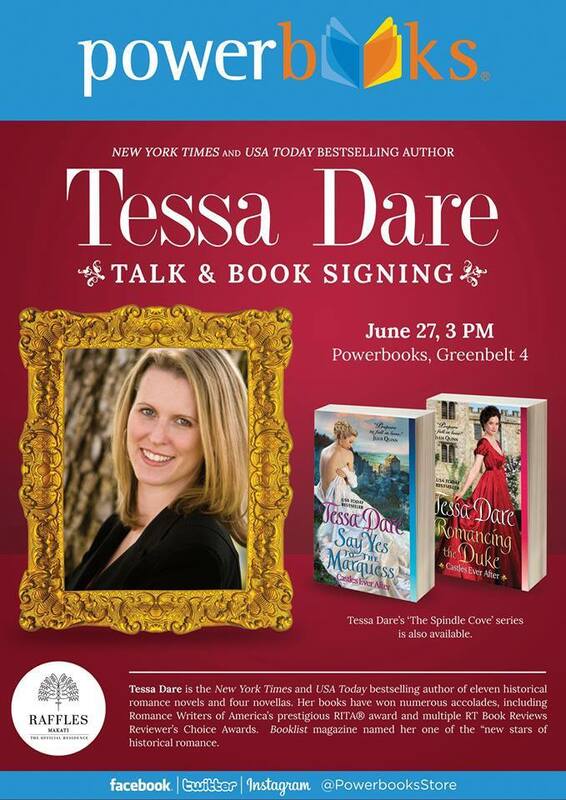 It sunk in ... Really sunk in, that Tessa Dare was here ... And I would finally get to hear her talk. And I would finally get to talk to her. As early as 11, when registration started, some of Tessa's fans had already staked out seats. I was so, so excited! I took my seat at around 2:30 and could see fellow readers with stacks of her books beside them. I sat beside this lovely lady who was actually reading Tessa's book while waiting for the event to start (book 3 of The Stud Club Trilogy, I think). More topics were covered, but it took me a while before I recovered from my starstruckness and started taking notes. 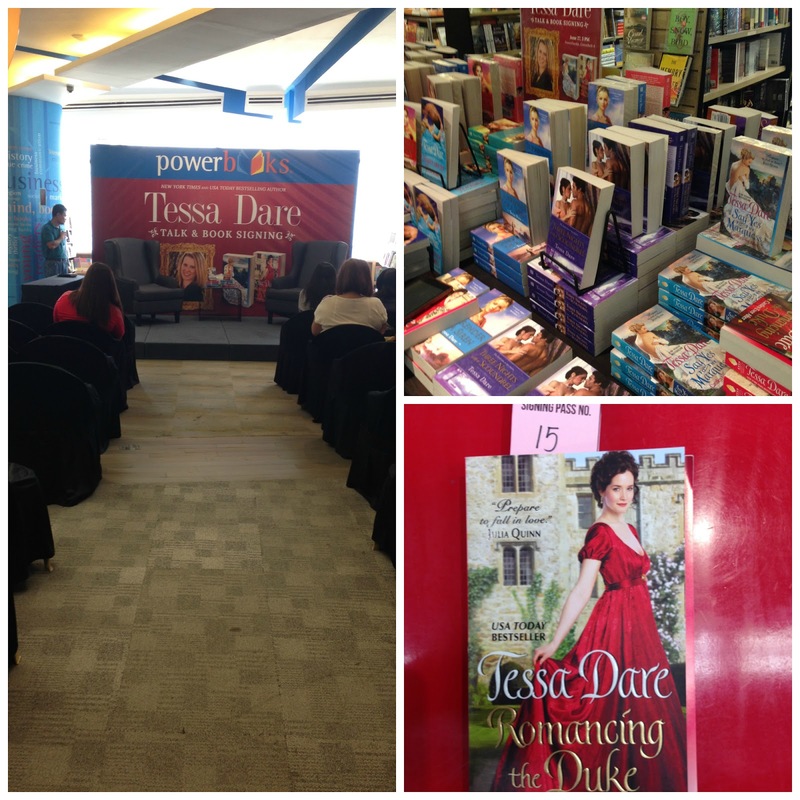 I loved when Tessa Dare talked about Romancing the Duke. Tessa Dare cited 2 trending hashtags in the Philippines: #mayforever (there's a forever) to describe Izzy and #walangforever (there's no forever) to describe Ransom. She also talked about her upcoming book, When a Scot Ties a Knot, which comes out this August, and I could sense the excitement and anticipation of my fellow fans as Tessa went on to narrate the really fun premise of the third book in her Castles Ever After series. - how does she stay faithful to the period, but still have a more contemporary feel? - does she have a say on cover design? 1. When Tessa said, "There are as many love stories as there are couples in the world." I have read several times on the blogosphere that the romance novel is dead. That a sub-genre of romance is dead (paranormal, historical, etc) -- that there isn't anything new. That everything reads and sounds the same. I loved how certain and confident Tessa Dare sounded, and how true it is -- as a long-time reader, I am amazed by the creativity and insight and freshness that each new story offers. I've often said that romance is a tricky genre to write because there are fixed parameters (hero + heroine + obstacle + happy ending) -- but our beloved romance writers have proven time and time again the boundlessness of the genre. 2. "My goal is to make the reader laugh, cry, sigh and blush." 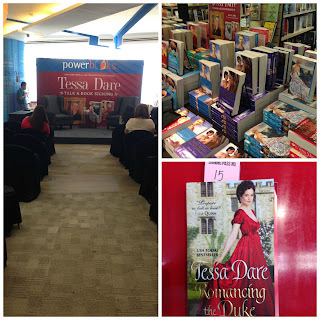 It's this last one that really made my heart "sigh" (to borrow Tessa's words) -- just by being here, Tessa has made us realise that we aren't solitary in our love for romance novels. That we are many, and as diverse (and as quirky) as the characters she has created in her beautiful stories. Thank you, Tessa Dare (and her wonderful family) for taking the time to meet and talk to all of us. 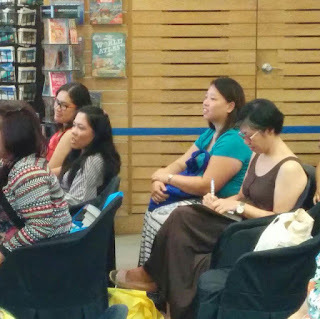 Thank you National Bookstore and Powerbooks for believing in the genre, and for trusting the fans. Almost my turn. Not sure if I was going to pass out or cry, or do both. And then she hugged me, and all was right in the world. 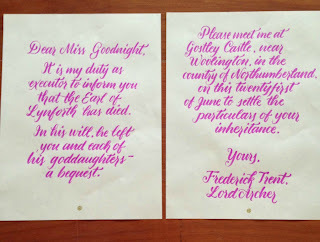 Last summer, I attended an introductory workshop on Letter Art and our facilitator was the very young, and very talented Denise Silva. 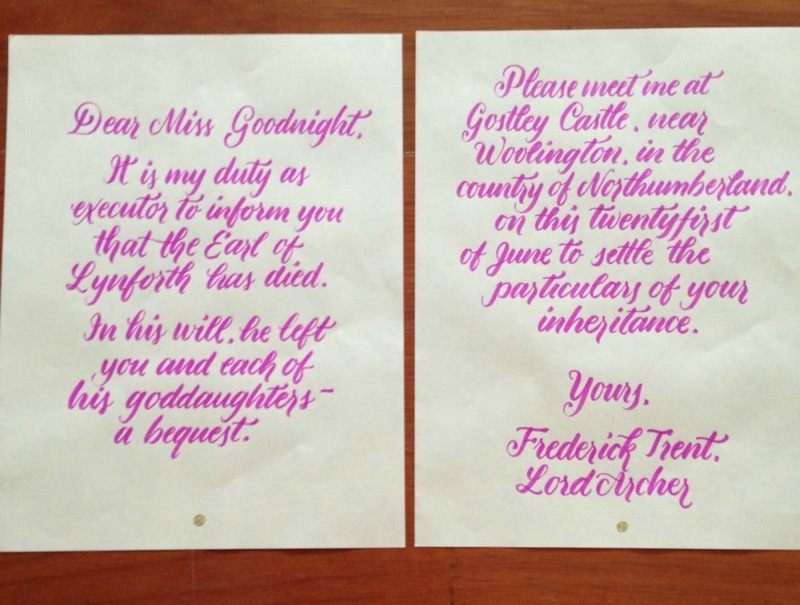 I asked her to copy out the letter that Izzy received informing her of the castle she inherited. When Denise showed me the work, I got so excited! It turned out sooooo beautifully, don't you think? oh that is just awesome!!! I love Tessa Dare, all of her books from her backlist to her recent ones I have adored. So glad you took the opportunity to meet her and the pictures are fantastic, looks like you had fun.